Finally, after 10 long days daddy is finally home again. Harry was so crazy when he saw J was standing outside the door. During the past week we have been with Dennis and my mother in law for a few hour every day, I have worked from her house Monday and Friday, and when I spent in the office. On Tuesday we were on our second puppy trim with Rebecca. Now you can see a little more of his face and she also cut around the paws. He is so handsome, and received so much praise that I almost blushed. We’ve been at the garage with the car and switched to summer tires, which was very exciting and a little scary – it was a lot of people there that he didn’t like, the sounds of the workshop didn’t bother him. Big brother Dennis and his owner stopped by for a playdate. 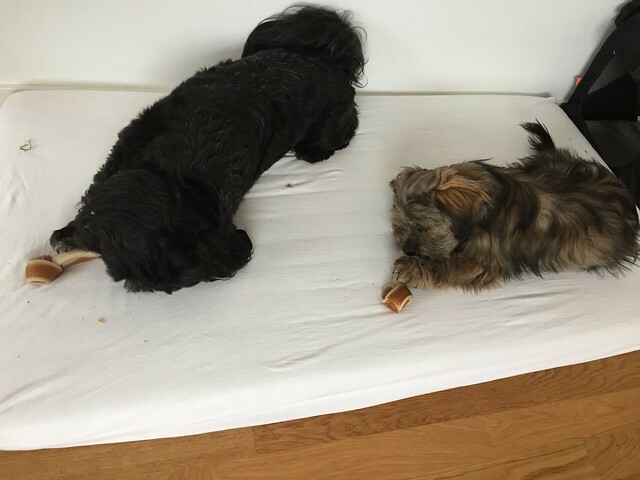 While we drank coffee they got bones to chew on, Harry periodically stole Dennis bones in the belief that it was tastier – haha. And Dennis, who is so kind, said nothing and just took the bone Harry had. Today, we have brought out the robotic lawn mower, vacuumed my car, went out for a walk where we met no less than 7 dogs. Guess if it was someone who had to hurry home. One of the dogs was very quiet and had a super kind owner who stayed with us for a while and finally Harry dared to go have a sniff. 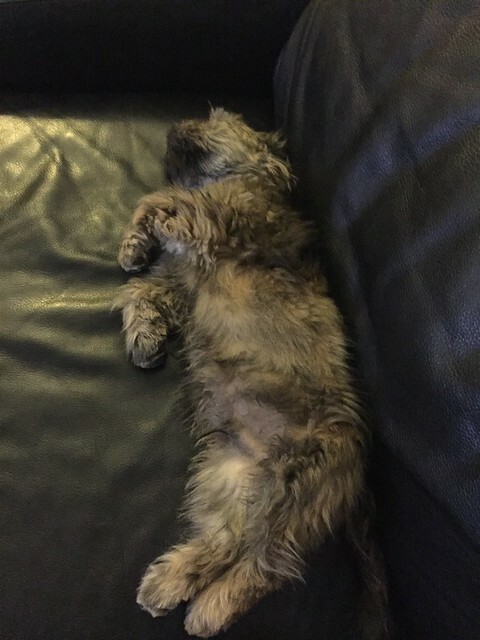 Now he lies beside me on the sofa and snoring and dream. There has been an eventful day. I’ll end this post with a little video from yesterday when Harry got ice cream for the first time.